On April 20th, Fyre by Angie Sage showed up on the Kids' EBook Bestseller List when it hit the number 4 spot in the Kids' section of the Barnes and Noble Nook store. 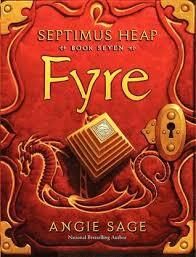 Fyre is Book 7 in Angie's popular Septimus Heap series. She joins us today to share her thoughts on her e-publishing experience. Let's start by finding out what Fyre is about. 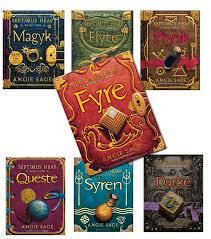 Fyre is the last book in the Septimus Heap series and it is, I hope, where things finally come together and many questions are answered. It begins with Septimus getting ready to serve a month as apprentice to the recently re-instated Castle Alchemist. But given the old enmity between the Castle Alchemists and Wizards, this is not going to be an easy month. Add into the mix Septimus’s oldest brother, Simon, plus couple of particularly unpleasant Darke Wizards and a ancient ExtraOrdinary Wizard ghost who is not all he seems and you can see that it will be an interesting time for Septimus. And don’t forget his adoptive sister, Jenna, who is about to become the Castle Queen. And a beautiful creature, half boat, half dragon. And a few lively pebbles into the bargain. It all happens in Fyre! My path has been traditional. When I began writing it was the only option. I do think it is very interesting right now, to have other possibilities. But I think I would have still tried for the traditional first. I have written Septimus Heap for all ages. You can begin reading it about age eight or nine and just carry on. I guess the main group of readers are early teens, but then I do get a lot of feedback from young—and not so young!—adults too. I suspect the e format is bought by the older readers, my impression is that the younger ones still like to have a book in their hands. And HarperCollins does go to a lot of trouble to make the Septimus Heap books really lovely objects in their own rights. I do see e publishing is just another way of getting the story out there. The only reason for being at dubious about it is, I suppose, the possibility of illegal downloads. But apart from that, why not? I just want to get Septimus out there to as many readers as possible and e publishing is a great way of doing it. So far there’s been nothing unexpected! I don't see why the two cannot run along in parallel. They both have different advantages: e publishing for ease of carrying the thing around with you and immediate access too. But if you truly love a particular book I think you will always want to own a hard copy. So I suspect that books will become more special as objects to collect in future—especially in their hardback editions. I see it as a neutral thing. Neither helps in particular nor hurts. Just another way of doing things. And anything that makes it easier for people to read seems good to me. You can find out more about Angie and her books at the Septimus Heap blog, the Septimus Heap Facebook page, Angie's Facebook page or by following her on Twitter. See the updated Kids' EBook Bestseller List, updated every Saturday morning, for the top ebooks for kids and young adults. 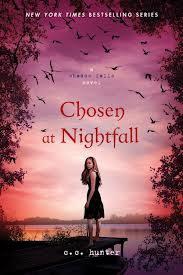 CHOSEN AT NIGHTFALL: Chosen By Teens To Be a Bestseller! Back in November of 2011, C.C. Hunter did an interview for this blog when her book Awake At Dawn hit the top ten in e-format. (See the interview HERE.) Today she's back again. On April 27th, Chosen at Nightfall hit the #2 spot in the Teen section of the Barnes and Noble Nook store. It's the final book in her popular Shadow Falls series. C.C. chose different questions for this interview from the ones she chose for the first interview, so we get even more insight about her road to e-pub success. First, let's hear what Chosen at Nightfall is about. When all you want is to just fit in, accepting you aren’t all human is a real b with an itch. In the fifth and final book of sixteen-year-old Kylie Galen’s story, she’s coming into her unexpected powers, learning who she is, what she is, and who she’s meant to love. When Kylie’s most prevailing enemy returns and threatens someone close to her heart, she must embrace all her powers or lose everything. I think that to succeed in writing you first must have a good product—a good story that resonates with your targeted audience. But to take your success to the next level, you must find the universal emotion that will appeal not just to your demographics, but to the masses. 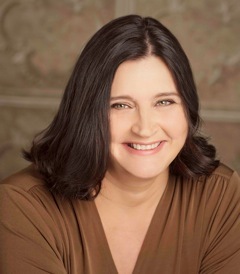 Having written eight books for adults when I started the Shadow Falls series, I purposely set out to write a book that could appeal to both teens and adults. I believe finding a relatable premise that crossed the age barriers has helped the series do well. My first step into e-publishing was with my backlist from a publisher who was facing financial issues. To get those rights returned to me, I had to walk away from large sum of money. It was both exciting and slightly overwhelming to suddenly have to deal with all the angles of publishing. But I more than recovered all that was owed to me, and I learned to cope with all the additional work brought on my self-publishing. I still release some of my own works, as well as write for traditional publishers. Chosen at Nightfall was just released by St. Martin’s Griffin, and I was told over half my sales were in the e-book format. I think e-publishing just offers authors a new venue in which to sell their work. The more venues we have, the more opportunity we have to appeal to the mass of readers. E-publishing has opened doors to me and my career, and I’m thrilled to be a part of this growing industry. The thing that really surprised me was the sense that e-publishing created a civil war in the publishing industry. Instead of being North and South, you were either e-published or traditionally published. It totally baffled me. Because in my opinion, what should define a book is the author’s work, and not the format in which the book was published. Later the issues weren’t so much if the book was e-published, but if it was indie published versus published by a traditional publisher, be it in e-format or print. But again, I felt a book should be judged by the work itself and not the publisher. The rise in popularity in the indie, mostly e-book market still has some traditional publishers frowning upon their authors stepping into the self-publishing pond. And while it’s clear why they would worry, I felt very fortunate that both my traditional publishers viewed my adventure into this arena, not as a threat to my future career with them, but as a method to draw in new readers. One of my publishers came to me suggesting to put ads about my traditional published works in the back of my Indie e-books. The increase in sales was apparent in the e-print book rankings. I think the publishing industry continues to evolve and at this point, the only predictable thing is that it will continue to change. To secure a place in this business an author, as well as the publishers, must be willing evolve. All my books, with exception to a few novellas, are available in both print and e-format. I bought print stock of my backlist adult titles which were originally published by Dorchester and offer them in print at my website. My one indie published novel went first to e-book but is now offered in print. I felt I had to do this due to the fact that so many of my adult readers are still solely print readers. In time, this may chance, but until it does, I will continue to do all I can to reach as many readers as possible. Find out more about C.C. Hunter and her books at her website or follow her on Facebook or Twitter. And be sure to stop back on Saturday for the updated Kids' EBook Bestseller List and an interview with Angie Sage, author of Fyre. Our featured author today is Marie Hall, author of A Moment, which climbed to the #6 spot in the Barnes and Noble Nook Store on April 27th. A Moment is for the New Adult age group (think college age), but until the online bookstores fine tune their categories, New Adult books are grouped with Young Adult books. I'm sure you'll enjoy not only hearing about Marie's book, but also her insights on indie publishing and her marketing strategy. I know I did! 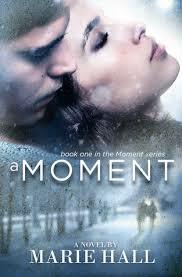 Let's get started with a description of A Moment. Spending Valentine's Day at a burlesque bar hadn't been Liliana's ideal way of spending a Friday night. She'd much rather be back at campus, doing homework... until she meets Ryan. Tall, athletic, and gorgeous, Lili can't keep her eyes off him, and despite his gruff manners and drunken disposition she's intrigued. Well, originally I had the book for sale at 2.99. But, I began publishing with fairy tale retellings, basically it was like starting all over again. Having to find my contemporary audience. So to do that I figured I'd have to drop the book to .99 cents as a promotional tool. Immediately I began to see many downloads. But not enough to get into the top 100. To do that I planned a book blitz. I contacted E-News Reader Today, ENT for short, and Bookbub. Both places agreed to promote my book and I got very, very lucky because I was able to get both places to promote back to back. So having ENT go first one day, and then Bookbub the next I saw a massive amount of downloads which immediately catapulted me into the top 100. Once I got there it helped generate a great amount of constant downloads that's promotion in and of itself. My target audience is 17+. Young adults on the cusp of freedom, college, moving away from home. That is the audience I feel will understand and resonate with my characters. And that crowd is perfect for the e-format, they are the ones you see walking around with the new and fabulous techie gear. They are the ones who're the first to jump into the e-market with both feet and they are the ones I specifically market toward. I will be honest and say back in 2010 when Indie was really first starting to take off, I looked at it much like vanity press. Something to keep my distance from, because it just didn't seem like the next big thing. Of course, I wish I could invent time travel now and go back because I could never have anticipated how HUGE indie would become. Indie publishing came first for me. I'd tried for years to get NY interested in my works, I had an agent who was very much behind my work, but we could never seem to make NY care. So one day a friend of mine gave me all the data on Indie and told me, just put a book up there. I decided to start with a novella length fairy tale romance. My first book, Her Mad Hatter, saw marginal success for an author who was a complete unknown. I followed that book with the sequel, Gerard's Beauty and that's when I decided to drop Hatter to a permanently free title. When I did that my book took off. It boosted the sales of each subsequent book and was completely eye opening. I'm now NY published, but have discovered that I really enjoy the freedom of Indie. It's great being able to straddle both sides of the fence, seeing how Indie works, how NY works. I think overall it's made me a more well rounded author and promoter of my books. I'm constantly learning and in this business that's never a bad thing. 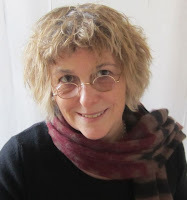 Learn more about Marie Hall and her books at her blog. And have a look at this week's Kids' EBook Bestseller List. Perhaps you'll see some old favorites...or find some new ones! Stop back on Wednesday for an interview with C.C. Hunter. This will be her second visit -- she's been a top ten author several times in several stores with her various books. Want to keep up with all the interviews? Follow me on Facebook and/or on Twitter. The Thief, by Megan Whalen Turner, hit the number 3 spot in the Kids' section of the Barnes and Noble Nook store on March 30th. As you can see by the cover, it's the winner of a Newbery Honor. Megan has taken the time to answer quite a few of my questions about her experience with electronic publishing. Enjoy! First, Megan, tell us what The Thief is about. 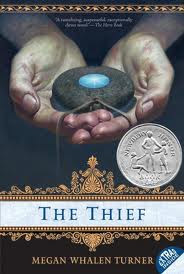 The Queen of Attolia is the second book in a series that begins with The Thief. It's almost impossible to write a synopsis of Queen without spoiling Thief, which I hate to do. So I will just say that I set my stories in a landscape that was inspired by Ancient Greece, but is a lot more Byzantine in its technology, with a pantheon of goddesses and gods highly invested in the fate of three tiny countries, Eddis, Attolia and Sounis. My main character is a thief. He is both clever and highly skilled (and knows it, and brags about it) which is why it comes as such a surprise when he is captured after trespassing in the palace of the Queen of Attolia. His capture sets off a chain of events that leads to war among the three countries, with abductions, intrigue, and some interference from the Gods. I guess Traditional is probably the right word, but it was highly unconventional. I sent two of my short stories to Diana Wynne Jones. 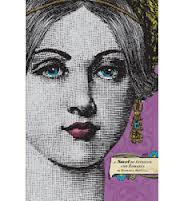 Not only was she gracious enough to read them, she recommended I send them to her American editor Susan Hirschman who agreed to publish my collection of short stories, Instead of Three Wishes. That was in 1995 when everything was on paper. A great deal has changed since in publishing since then. I know exactly! I blame David Macinnis Gill. His excellent science fiction book, Black Hole Sun, was a Free Fridays selection on the Nook Blog. David got a chance to recommend any book and chose mine. Thanks, David! I am embarrassed to say he writes a better blurb for my book than I do. You mean other than David? Honestly, I have a great team of people at Greenwillow who support my books. They are very patient with my failure to tweet or blog and they do a great job. I've been really lucky to have readers who recommend my books to their friends and family. I was going to say "by word of mouth," but I think many of the recommendations are passed around electronically. Because I write children's book and books for young adults people sometimes ask what age group the books are for and it's tricky to answer. I write for people who really like to read, who like to read fantasy, and who like to read a book over and over. I get fan mail from readers as young as ten, but those readers usually go on reading the books as they grow older. Many of my readers are adults. I am embarrassed to admit that quite a few of them have become adults while waiting for me to get my books written. I don't think my younger readers have moved to the e-books as quickly as my older readers have, but I think it is happening slowly but surely. I've been very excited about e-books from the first time I tried reading on a hand held device. I realized how vast the difference is between reading on a screen fixed to a computer on a desk and reading on a device you can hold in you hand like a book. Suddenly, I could imagine reading 60,000 words of an e-book. I didn't realize until I started reading e-books myself that the format alters the way I read. I am much less likely to flip back a few pages to check for something I might have missed in an e-book and also less likely to sneak a peek at the ending. Over time, I imagine both these things could affect my writing. All my books have begun in print format and are still available in that format. All of them have subsequently been released as e-books by my publisher. I do think that e-publishing will take over print publishing, but I don't have any idea how long it will take. I think the biggest difficulty facing readers today is finding the next book they want to read. I'd like to see a better mechanism developed to connect readers to the books they want. I'd also love to see a safe way for young readers to connect online with other people who love the same books they do. As a writer, I think that the more ways there are to read a book, the better. Adding e-books to the option for readers is a great benefit. Subtracting print books from the options would be an equally disturbing loss. As a reader, I hope we never get to the point that we don't have second hand bookstores full of cheap paperbacks for me to read. I worry about accessibility. Not everyone has an e-reader, but accessibility isn't just a matter of money. It's about encouragement and community support for reading. When a teacher leads her class to the school library and tells them to pick out a book, it is a community activity. Not only can you see that everyone is reading, you can see what they are reading. Will the same thing happen when there's no physical library and no physical books? When a child sees an adult reading a book, it sends a message that isn't sent by a man looking at the screen on his phone, even if the man is reading Catcher in the Rye instead of watching a music video. As our e-reading increases, I think we need to find new ways to send the message to kids and young adults that reading is a great adventure. I lived for a year in Norway and bought almost all of my books electronically. I am looking forward to a time when people can easily buy any book from anywhere in the world. Find out more about Megan and her books at her website. And check the newly updated Kids' EBook Bestseller List for more top ten books. For some reason, the B & N Kids list is dominated by classics today which is odd, but I report it as I see it. Enjoy! Prisoners In The Palace was Michaela MacColl's first novel. Originally published in 2010, it's now enjoying new popularity in electronic format. Michaela's book hit the #7 spot in the Teen section of the Barnes and Noble Nook store on April 13th. When I contacted her, she said, "I would be delighted to participate. I mentioned this to Lara Starr my publicist at Chronicle and she said in fact Prisoners ended up at No. 1!" Hurrah! Today we get to hear all about Michael's epub success. First, tell us a bit about the story of Prisoners In The Palace. In London of 1836, sixteen-year-old Liza's dreams of her society debut are dashed when her parents are killed in an accident. Penniless, she accepts the position of lady's maid to young Princess Victoria and steps unwittingly into the gossipy intrigue of the servant's world below-stairs as well as the trickery above.Liza has to learn how to navigate the intrigue at the palace, the difficulty of befriending a spoiled princess and falling in love with a journalist, while protecting Victoria from hostile forces who want to break the future Queen's spirit. I'm a traditionalist! It mattered to me that my book be accepted and vetted by a well-respected publisher. I began writing about ten years ago off and on. I went to conferences and took classes. One of my teachers introduced me to her agent and he found a home for Prisoners in 2008. Two years later, it was published! My publisher has been promoting the book on their website and I know that the price point was attractive! I have a website, authorFacebook page and I tweet. I don't do an enormous amount because I think it distracts from writing. My target audience is older middle grade and young adult. These kids are very savvy with iPads, Kindles and Nooks. Often they can buy e-titles themselves without a visit to the bookstore. While I worry about kids buying inappropriate books, I know that my books don't contain topics that kids shouldn't read. What were your initial thoughts about e-publishing? Was it your idea or your publisher’s? I wasn't consulted about the e-book version. It just appeared! Somehow the colors on the cover were wildly off. As soon as I brought this to the publisher's attention, they fixed it. Amazon chose it as a Kindle Book of the Day -- and we sold almost 10,000 copies in a single day. It was very fun to beat out Hunger Games for the day! Find out more about Michaela and her books at her website, or by following her on Facebook or on Twitter. And did you see Saturday's update Kids' EBook Bestseller List? Check it out for all the latest top tens in the top ebook stores!